I know next to nothing about Indian cuisine, and am not afraid to admit it. But if you don't have to be a musician to know a good song when you hear one, then it doesn't take a Madhur Jaffrey to appreciate how delicious Indian cooking can be or to recognize that it is one of the most complex, spicy, and robust of the world's cuisines. This lack of knowledge does make ordering off Indian menus an intimidating experience though. Even the most able English translations can only give you a vague idea of what's coming. Although they did not invent the Indian buffet, this Tustin restaurant has been getting raves from just about every corner of the foodie universe -- and for good reason. For a pittance ($7.95 for lunch or $11.99 for dinner) I can skip the menu roulette and do what must be done when I don't know what to order: Try everything. And everything at Haveli is worth trying. Spices dominate the food and pepper the crisp garlic naan. Fenugreek, cardamom, ginger (and a slew others I cannot identify), each sing its own notes, but together, in each dish, they harmonize -- the culinary equivalent of an entire symphony orchestra in your mouth. There's white-meat chicken chunks swimming in a gurgling brew so silky and ruddy it looks like thick lobster bisque. Don't let that fool you though. It's spicy -- meant to be eaten with rice to temper its strength. Next to it, the dark-meat of the bird simmers in a darker sauce with the color of toffee. It's hotter than its neighbor, but finishes with the slight tartness of tamarind. Veggies gets the saucy treatment too. A semi-sweet, but scorching gravy has button mushrooms floating in it like buoys. Another has peas and cubes of homemade cheese that tastes like mild ricotta. Potatoes are cooked with onions, dry-seasoned with curry, and blasted with whole spice pods. Eggplant is reduced to mush, as is the spinach, concentrating the flavors that will invade every sensor on the tongue, leaving none unstimulated. And as for a salad there's one mixed up from garbanzo beans, diced tomatoes and raw onions. This one will refresh the palate like no other salad can. But it will leave your breath smelling like, well, like raw onions. Pakoras -- fried vegetable fritters covered in chickpea batter -- are fresh, crisp, and hot. They're ideal for dipping in Haveli's perky-green, herby sauce which smacks of mint. 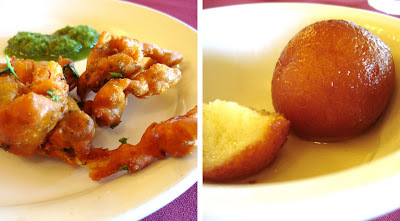 Once you finish gorging, there's the gulab jamun, golf-ball-sized orbs of fried dough steeped in syrup. It tastes like bread pudding soaked in sugar water. But if you're lucky, there will be gajar halva, a pudding of sorts consisting of shredded carrots, spices and sugar. 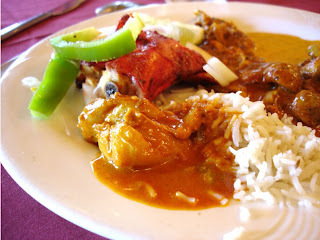 I never had it before my visit to Haveli, but that's exactly why I love their buffet: I wouldn't have any idea what it was if I had just seen it on the menu. But now I do. And if you've read this far, you do too. Think of what else you'll discover at the buffet. NOTE: Haveli's dinner buffet is only available on Tuesday and Wednesday nights. Their lunch buffet is offered daily. What a cool way to get introduced to Indian food! Thanks for the great review. that place is like right next door to me, so I definitely need to go. i love this place!! is it just the times that i visit, or does this place rarely have any customers? Hey Elmo...did you keep a light on for me? Been on vacation and catching up. Is this next to Sushi 5?? If so, my future sister in law went and loved it. Once again, uncovering the gems of the O.C. It's a great way, and probably the best way to eat Indian, even when I get more familiar with it. I'm always a sucker for bargains. Be sure to use one of their coupons. They advertise with local mailers and also there's a coupon on their website! I think they're pretty dead during dinner time, but it was busy at lunch on a Friday. Not every table was occupied though...so it's still not as popular as it deserves to be. Yup! I'm all about the coupons! It saves you about a buck off, but hey, it's still a buck off! Welcome back! Yep, Haveli is the one you're thinking about. On the same side of the street as Sushi 5, right after the gas station, and across the street from Wahoo's. OMG! I have to go there. Thanks for the tip. Have you been to Chakra near UCI? It's wonderful.. not the bargain like this place, but still very good. Great review. Do you know if the buffet at dinner has a bigger selection than lunch? great review! you write well, elmomonster. elmo, thanks for your quick response! much appreciated. Haven't tried Chakra but heard wonderful things from a few readers. Man, I keep forgetting about the tips that people give me. I really should write them down somewhere. Actually other than samosas instead of pakoras, dinner seemed almost identical as lunch. So it's a better deal during lunch. Although I hear they do lamb during dinner sometimes (not the time that I went though). Thanks for the comment! I like comments! I've done the same for you. I hope to visit often! Sounds yummy! Dave and I love Indian food. I prefer the South Indian cuisine myself. The flavor is lighter. I know I've mentioned this place in my blog before, but next time you find yourself in Michigan, you have to go to Temptations in Ypsilanti (near Ann Arbor). In addition to the standard fare you find at most Indian restaurants, they also have South Indian and Indian Chinese food. Yum! I do love this place. Excellent food and service. The only drawback is that it is way too yellow inside. Pls feel free to forward to anyone who might benefit. I only do buffet when it comes to Indian. Seems so pricy a la carte! i've enjoyed your reviews, so i was wondering if you take requests to review places? i've been curious about this korean shaved ice place called ice kiss. it's in k-town though... might be kind of far for you. the idea of buffet anything tends to turn me away, but with indian cuisine, it's really the best way to try a little of everything. there's so much more to the flavor profile than just curry. Indian Chinese Food!? Wow, I gotta find me some of that. I think I heard of one somewhere in L.A. If anyone knows of it, let me know. They're relatively new. I think it's no more than a year old. You're right. It is yellow in there. As if Spongebob threw up on the walls. Cool! That's a nice TV. Ice Kiss eh? Actually I'll be reviewing a new place in Irvine that looks to be similar...not exactly the same but similar. Stay tuned. Actually, I've been lurking on your site for the past week. I'm going to link you shortly! That salad your mom made looks simply awesome! Your descriptions of Indian Food sure don't sound like you "know next to nothing!" I've missed you and your posts Elmo, I am glad to be catching up on them this weekend. "I think they're pretty dead during dinner time, but it was busy at lunch on a Friday. Not every table was occupied though...so it's still not as popular as it deserves to be." Hey there! Hope to hear about more of your adventures in Nola! You picked no better place than Cafe Du Monde to start. Let's hope they get more business. Although I'd love to take credit if they do pack 'em in, it's the food they cook. Yummy. Make me salivate just thinking about those hot, crispy pakoras. Huh. I dunno how I missed seeing this post. I agree with you, amigo. 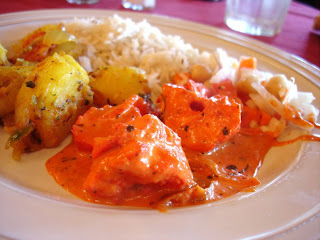 Indian food is one of the world's great cuisines. It's also very original, meaning it derives little of it's cuisine from other style of cooking, but contributes to the cuisines of the many of the countries surrounding it. I'm sitting in Haveli writing this on my Blackberry on Monday night. Apparently they don't do the buffet every night because I had to order off the menu. Ordered the lamb curry, which hasn't yet arrived. You're right about that. Other cuisines copy Indian, not the other way around. Shows how much Indian food has reached its pinnacle. Oh man! Sorry about that. I had no idea they didn't do the buffet on Mondays. I went on a Tuesday night because I had a coupon for 10% off the dinner buffet on Tuesdays/Thursdays. I had no idea that it *actually* meant that they only have the dinner buffet on those nights. I'll put a note on my post. The restaurant website, the flyers, not even other reviews says it. This one will. Hope the lamb curry was good! Wow... I saw this place while driving around looking for a place to eat. We saw it on the road and actually stopped by to go in, but it was closed. 8 months later, I get to talking about and researching food blogs...your fantastic site pops up, and there it is... Haveli. Great review... I have to try it! God, the food looks deliciously appetizing. I'm going to try it for myself today hopefully. Researching food blogs eh? Well, I'm glad you found me...but you'll be even gladder when you eat at Haveli. Truly. Awesome. And a bargain too! It's pretty darned good. I wants me some pakoras right about now. Horrible food with worst sevice. i will never go there again. Also, reccomending others to see how owner chef is kitchen looks like before you eat anything. It was on LA times (Haveli in Tustin closed due to live roaches in the kitchen). the dishes looks so delish! Here I bought a sauce pack so as to skip all the seasonings! and i will try this friday after work.